Imagine coming home after a long day at work and slipping into your very own hot tub. Not only is it relaxing, but it also does wonders for your muscles and has many other health benefits. Large ones can be expensive, though. That’s why you may want to spring for a small one. Small hot tubs are cheaper and perfect for some one-on-one time with yourself or a relaxing soak with a friend or partner. There are different hot tubs out there with many different features. In this article, we’re going to tell you all about them so you can pick out the best small hot tub for you. There are many reasons why someone may be attracted to the lure of small hot tubs. Not everyone lives in a huge house. A small hot tub is the way to go if you have very little space. You can even get one that’s portable if you want to still have comfort during long camping trips or are planning on moving soon. Not only is the initial cost a lot less with a smaller hot tub, but the maintenance price isn’t anything to sneeze at either. In most cases, you’ll cut the price nearly in half just by going with a smaller tub. Smaller hot tubs come in a ton of shapes including circles, squares, ovals, and triangles. This means that it will be easy to find one that will fit the unique shape of the room or area you want to put it in. 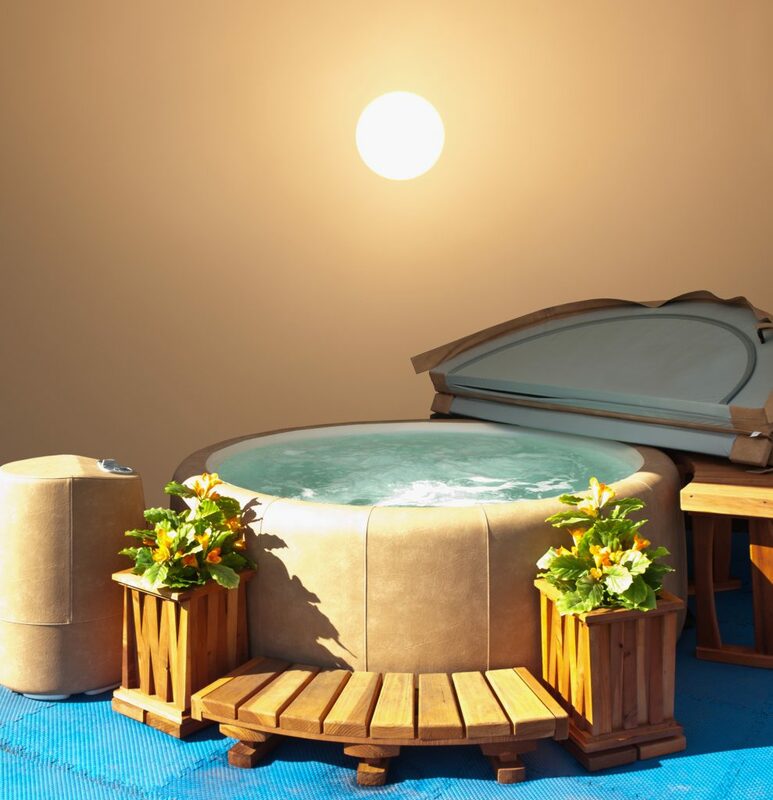 The two types of hot tubs available to you in the small category are “portable” and “permanent” models. They both function the way they sound. A permanent hot tub typically is installed outside in the ground, or installed in a way in which it can’t be moved. A portable hot tub can be carried around with you if you want to take it to a party, on a camping trip, or move locations. Another thing you have to take in consideration is the gallons of water to jets ratio. A large number of jets coupled with large amounts of water makes for better hydrotherapy. The last thing you want to consider is the style and look of the tub. You want it to be relaxing, but you want it to look nice too. For example, a small wooden hot tub would look completely natural coupled with a wooden deck. The price of your small hot tub will depend on what sort of features that you want. They may be cheaper than the larger ones, but you’ll still need to put a little bit of planning into getting one. The smallest portable hot tubs can start at around $400 and go up from there depending on what you want. With the permanent ones, you have to factor in installation costs so those can run you anywhere from about 2,000 to 4,000. If you lay off of more of the fancy features like Bluetooth speakers and unnecessary jets, you might be able to chop the price down a little bit. Now that you know around what price you’re looking at and some of the features you can get, we’re going to share with you a few models that might be right for you. The Lifesmart Luna is a plug and play model. It will need at least a 15 amp circuit outlet and you won’t be able to have any other appliance plugged into the same circuit. It will give you a traditional hot tub experience, just make sure you have room in your budget for it. The Bestway Miami will give you a great bubble massage and is super easy to install. Not only is it easy to install, but it will install almost anywhere you want it on your property. It’s easy to maintain because the surface is smooth and easy to clean, and the water balance is simple to keep up. It is inflatable, but it’s really hard to puncture. This one will serve its purpose and give you great results. But you won’t be able to just install it and forget it. The pH levels are hard to maintain and the filter is a little finicky. This isn’t a deal breaker, though, you just have to make sure to replace the cartridges at least once a week. If you’re persistent in caring for the Lifesmart Simplicity, then you’ll have a tub that produces great results, and looks really nice as far as style and color. This QCA model is another plug and play hot tub, but it has a harder installation than the Lifesmart Luna. It can’t hold as much water as some of these other examples, but it’s still comfortable enough for two. The hypnotherapy jets and elongated design of this tub actually make it ideal for two people to enjoy. Small hot tubs are a great way to relieve stress after a long tough day. Soaking in one is the perfect way to loosen up your tense muscles along with a few other health benefits. Find the perfect tub for you so you can start reaping these many benefits. Ready to get started on your own spa or indoor hot tub set up? Let us tell you about all the accessories you’ll need.